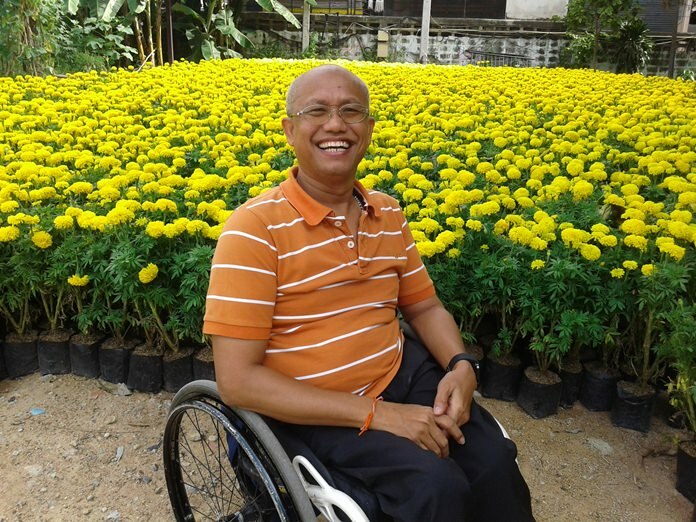 Students from the Redemptorist Vocational School for Persons with Disabilities helped raised funds and marked HM the Queen’s birthday at the same time by selling marigolds for Mother’s Day. School executive Manop Eimsa-ard presides over the opening of a market selling flowers planted by disabled students for Mother’s Day. School executive Manop Eimsa-ard presided over the opening of a market selling flowers for Mother’s Day Aug. 10. Normally, jasmine flowers are used to create garlands and other arrangements to offer mom on her day, but the school tried something new by selling flowers planted by the disabled students. A thousand marigolds were prepared for the sale at 12 baht each. That’s less than most flower shops. Money raised will support the students and cover costs of the Aug. 20 memorial service for the school’s founder, “Father Ray” Brennan.